Four Star Homes has been proudly serving clients and customers throughout Central Florida since 1982. 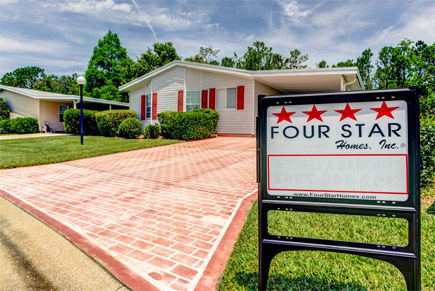 Four Star Homes has been dedicated to providing excellent service for all of our clients by fostering trust through the mobile home buying and selling process. Our Florida offices and 150 professional agents, are committed to building lifetime relationships with all of our customers. To do this, we provide professional assistance in understanding true market conditions throughout Florida for all buyers and sellers of mobile home units. Our staff of experienced professionals pays close attention to every detail of your real estate transaction, from preparation to successful closing. We have dedicated our resources and time to supply the best service so we can sell your mobile home or put you in the community that will best reflect your values. We pride ourselves on this commitment to detail, which is why we make sure that the communities we serve reflect those very same values and beliefs. Our dedication to honesty, integrity, and service is second to none. Our staff of caring, proven-professionals are the ones you can truly rely on to help you with any and all of your buying or selling needs for your mobile home. Whether buying or selling a manufactured home, let Four Star Homes work for you! We are the kind of people you can rely on. Why choose Four Star to buy or sell a home?